Beginning Friday, October 1, 2010, a new block of tickets will be on sale for performances through May 30, 2011, of Million Dollar Quartet, the Tony-nominated musical inspired by the famed 1956 recording session that brought together legendary rock 'n' roll icons Johnny Cash, Jerry Lee Lewis, Carl Perkins and Elvis Presley. The production continues to break box office records at the Apollo Theater, 2540 N. Lincoln Ave., Chicago. Million Dollar Quartet features Emmy Award-winning actor David Lago (Elvis Presley), accomplished musician/performer Lance Lipinsky (Jerry Lee Lewis), Chicago musician and actor Gabe Bowling (Carl Perkins), Jeff Award nominee Sean Sullivan (Johnny Cash), Tim Decker ("Father of Rock 'n' Roll" Sam Phillips), Kelly Lamont (Elvis' girlfriend Dyanne), Billy Shaffer (Fluke/Drummer) and Chuck Zayas (Jay Perkins/Bass). Million Dollar Quartet is simultaneously playing on Broadway. The Broadway production opened April 11, 2010 and was nominated for three Tony Awards, including Best Musical. "Million Dollar Quartet's run thus far in Chicago has been spectacular. In fact, our houses are still breaking records and the feedback we receive about the fascinating story, rockin' music and excellent musicianship never ceases," comments Producer John Cossette. Producer Gigi Pritzker adds, "We couldn't be more thrilled to have Million Dollar Quartet playing in both New York and Chicago. Earlier this season, Million Dollar Quartet had a great night at the Tony Awards and we are all so proud of our nominations-including Best Musical-and Levi Kreis' win for Best Featured Actor in a Musical. Audiences are loving the show, and our stellar Chicago cast continues to play to packed houses at the Apollo Theater." On December 4, 1956, an auspicious twist of fate brought Johnny Cash, Jerry Lee Lewis, Carl Perkins and Elvis Presley together. The place was Sun Records' storefront studio in Memphis. The man who made it happen was Sam Phillips, the "Father of Rock 'n' Roll," who discovered them all. The four legends-to-be united for the only time in their careers for an impromptu recording that has come to be known as one of the greatest rock jam sessions of all time. Million Dollar Quartet features a treasure trove of the greatest rock 'n' roll, gospel, R&B and country hits from these music legends, including "Blue Suede Shoes," "Fever," "Sixteen Tons," "Who Do You Love?," "Great Balls of Fire," "Riders in the Sky," "Whole Lotta' Shakin' Goin' On," "Folsom Prison Blues," "I Walk the Line," and "Hound Dog." Million Dollar Quartet captures the infectious spirit, freewheeling excitement and thrilling sounds of a singular moment when four of the music industry's most extraordinary talents, all in their creative prime, came together for one of the most memorable nights in music history. Million Dollar Quartet had its world premiere at Florida's Seaside Music Theatre, and was subsequently staged at the Village Theatre in Washington, breaking box office records. In Chicago, the production moved to the Apollo on November 5, 2008, following its sold-out, limited engagement at the Goodman's Owen Theatre. 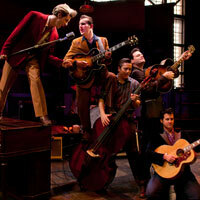 The Broadway production of Million Dollar Quartet is now playing at the Nederlander Theatre, 208 W. 41st Street. The Broadway production has garnered three Tony Award nominations, including Best Musical, Best Book of a Musical and Best Featured Actor in a Musical, Levi Kreis; three Drama League Award nominations; and an Outer Critics Circle Award nomination. Tickets are available online through Ticketmaster.